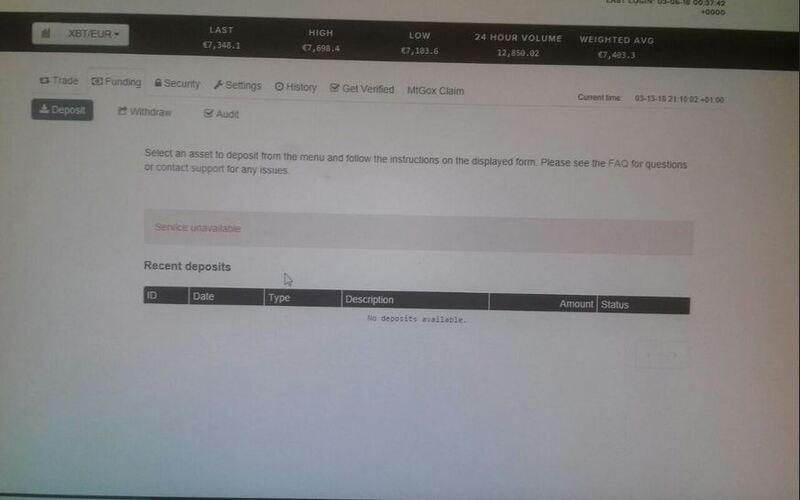 i am from germany and when i click on deposite .the site show " sevices unavailable " and my account is Verified to tier 3. Hi hamade. I'm sorry to hear that you're receiving an error message. Could you please open a ticket here and escalate that ticket using this form? Thank you for your patience. Hello hamade, the issue you are having is not likely bounded to your country. Have you already opened a ticket? Hello latoxine34 your ticket is in the queue to be attended by an specialist and it might take a while. Regarding taxes: as much as I'd like, we can't provide any tax advice and I'd suggest you consult with a local expert. just received the support answer. Certainly my english is not goog enough, but the answer is not appropriate. a) my name do not appear anywhere and b) the only document I have is a csv export without any legal infos on it , his answer will be clear = stop! Sorry if my english is not clear enought, and that I'm maybe crying before to be hurt, but if someone understand my question and want to translate be my guest ! I see what you mean, so probably Kraken will understand too! You need some kind of an official document from them with your name visible on it. I believe this document should be issued from their system with the press of a button, our accountant or another legal institution might ask us to provide it. Also, I believe that a simple name wouldn't be enough. VAT registration number or ID number would be more solid identifiers. Hello, does anyone here or from Kraken have a step by step guide on how to short on Kraken? I watched the video but im still not getting exactly what to do, many thanks! Hello themossinator I can't post links here yet, but a quick google search using the terms "short position kraken" will show three good articles/guides at the top, one of them is actually on bitcointalk. Hi Victorvpc. I'm so sorry for the long wait. Unfortunately, only a very specialized team is able to handle the situation in your ticket, and they have significant backlogs at this time. We will reach out to you as soon as we can. Thank you so much for your patience. 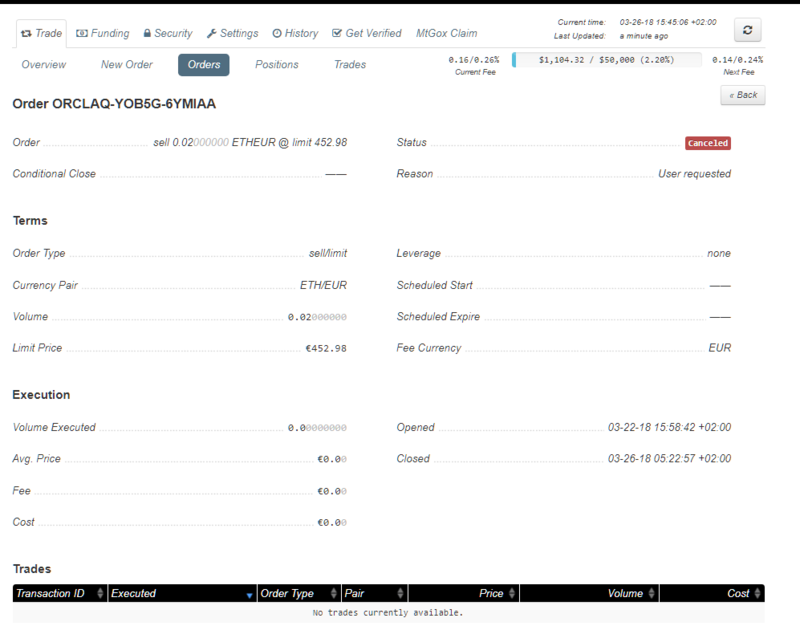 On 22/3 I bought the minimum 0.02 ETH using ETH/EUR pair, fee paid in EUR. Just after that I opened a sell for the same quantity (0.02 ETH) again using ETH/EUR pair, fee in EUR, WITHOUT leverage. Today 26/3 as seen from the picture I closed the order. To my surpise those 0.02 ETH (I don't have other ETH in my account) had become 0.01985 ETH for just being in an open position for a few days WITHOUT leverage. So my question is: does Kraken charge time fee for open sell positions WITHOUT leverage or was this a random bug in the system? Hi mdragganov. For this particular issue, I'd suggest opening a ticket here. This will need to be looked over by one of our team members to find out what happened. Please escalate your new ticket by using this form. Thanks for your patience. Hi mdragganov. For this particular issue, I'd suggest opening a ticket here. This will need to be looked over by one of our team members to find out what happened. Please escalate your new ticket by using /forms/2VolutBY6HBGJRRA3]this form. Thanks for your patience. Actually I sent the info to the support but I knew it would take months before they reply. You see most people complaining about Kraken (or any other exchange if that matters) are not right to do so. Because they don't have a problem: No, Kraken HAS a problem for not delivering a quality service. So I am quietly going to send my funds elsewhere. And Kraken will be well behind having lost fees and liquidity. Well done! Your ticket was resolved within 8 hours from opening it. If you need any further explanation, I would suggest letting Gui know. If there's any way we can better our service, please let us know. Hi, I want to store xmr to trade the fork. Will I be able to get the forked coins on Kraken. We do not have a formal statement about this fork. While we are always open to adding new digital assets to our exchange, we do not generally confirm in advance which ones will be listed. The best way to get up-to-the-minute details regarding which assets are being listed on Kraken is to read our email newsletters and to follow us here, or on on Twitter. Kraken makes no promises, guarantees, or warranties on the outcome of this or future forks. We will make our best effort to handle things in a way that benefits the most clients, but clients should manage their own wallets/coins if they want to ensure their participation in a fork. Thanks for understanding! I am not quite sure what you mean by "Your ticket was resolved within 8 hours from opening it". I haven't received any response from Kraken support regarding my issue. It looks for me a bit similar to bitfinex thats great becourse i have there also an account. Hello bitcoinvest! They are working as usual. Please note that they might take up to 5 business days to make it to you bank account. If transfer hasn't arrived after 5 business days, please create a ticket. Hi mdragganov. Could you please provide your ticket number?